Caring for your Mercedes-Benz vehicle is essential, as is with any other vehicle you may drive. That is why you need to be informed of the issues that may arise with the Active Body Control system employed in yours before it turns into a problem that can’t be fixed. We’ll go over some common problems the system has, why it happens, and how to prevent it from happening again. What is the Active Body Control System? This system is a type of suspension meant to help control your vehicle’s movements to stabilize it through risky maneuvers like taking sharp turns or braking quickly. As you can imagine, it is a pretty important safety feature. If it fails, your entire suspension system fails and you can no longer drive safely. There are a few things you may notice are happening to your Mercedes-Benz vehicle while driving that could be an indicator of ABC system failure. Other things are much harder to look for, so pay extra careful attention to the things that you can. If your “Drive Carefully” warning light comes on, this could be a signal that the control system is failing. Do not worry unless the light stays on or comes back frequently. Blue or white light is only a minor issue. The red light, you should worry about. When you see it, try not to drive until your car can be repaired. Sometimes, this is normal and is nothing to worry about. After a few weeks driving, you will likely notice that your car is sitting a little lower. However, having this problem within a week or less means that your system could definitely be having issues. If you notice any weird whining or humming noises, your problem may be with the pulsation dampener in your ABC system. It could also be a lot of other things but in conjunction with any of the other warning signs, this is the most likely cause. In the event that any of this is happening, you should know why. It will give the person repairing your Mercedes-Benz vehicle a starting point in where to look when you talk about the problems you are facing with it. This is quite a common issue. There are several different parts that make up the ABC system, so it stands to reason that there are many places the hydraulic fluid could leak from. When that happens, you may notice that your car will be sagging closer to the ground. In certain instances, this can make your car difficult and unsafe to drive. The body of your vehicle may drag on the ground, damaging so much more than just the failing system. If the valves in the parts of your ABC system are not properly sealed and locked, the hydraulic fluid could leak from them and keep it from getting to the right places. It could be happening even if you see no leak present. The valve block can sometimes get all gunked up if it has not been cleaned and maintained in a while. This means the filter has failed and needs to be replaced. 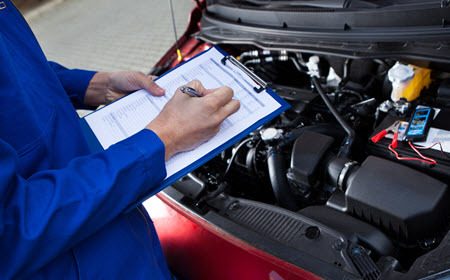 In order to prevent these problems from happening, you need to have your Mercedes-Benz routinely inspected and maintained. A qualified mechanic should be able to tell you what to do. dealership that will be qualified to assist you with the issues you are having. Not every mechanic can deal with foreign vehicles as well as they can with domestic makes and models. Luckily for you, you have Mark Douglas Motorworks to rely on. We at M.D.M. specialize in repairing Mercedes, Jaguar, BMW, Porsche, and more European and exotic vehicles. You can put your trust in us because we simply know what we are doing. If you live in or around the Orange County area, including Mission Viejo, Lake Forest, Costa Mesa, Irvine, Huntington Beach, Laguna Hills, or Laguna Nigel, CA, we have you covered! * Mercedes-Benz E-Class image credit goes to: y_carfan. ⟵When Should You Replace the EGR Valve in Your Audi?